Bring your Cardinals, Blues and St. Louis sports questions to a live chat hosted by columnist Jose de Jesus Ortiz starting at 11 a.m. Wednesday. Good morning. Thank you very much for joining the weekly chat. I really appreciate it. Please fire away. Should the Blues see how much they can get for Jake Allen, and turn the goaltending over to Hutton and Husso? This is a very good question. I would say yes to the first part of your question and I don't know to the second part. Regardless of what the Blues have said publicly, I believe they realize that it's a huge risk to stick with Allen again. It might be difficult to unload him, though. He can be truly spectacular and then frustratingly awful. The last two seasons have prompted many to wonder if he's mentally strong enough to be counted on as a true No. 1 goaltender. How long are the Cards going to give Fowler and Carpenter regular at-bats before we pull the plug? These guys look old. The advance metrics show that Carpenter would be wise to stick with his approach. 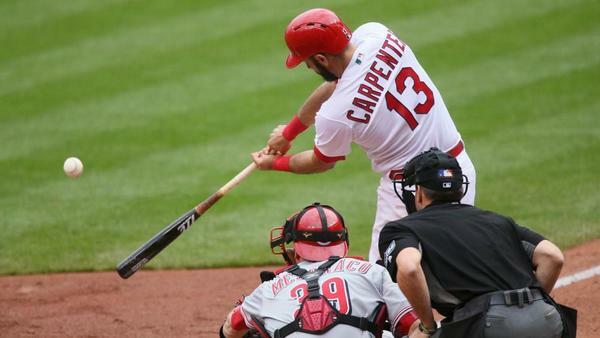 I wrote this piece last week, and it explains why there's reason for optimism with Carpenter. Fowler has had some clutch hits lately, but there's no doubt that he's struggling. Random piece of data. If Daniel Descalso played for the Cardinals - he'd have the 3rdd highest slugging percentage on the team (Behind Pham and Gyorko). What's a big enough sample size for a player to know there is problem vs. the bad luck argument? Thinking Carp and Fowler here. No angry fan, I don't have the answers, just it's really hard to watch them both struggle so much. How long is long enough? Thanks for the chats as always Jose! That is a very good question. I don't know that there's one universal answer. I would assume that there might be reason for concern if they're still struggling like this when the calendar hits June. That is a very good question. I don't know how to quantify that, but it's also clear that Ozuna has been a tad off this season. He's playing well, but he also recognizes that more is expected from him. Nonetheless, he is tied for the team lead in RBIs with 19. I have to think that Stastny is the obvious play for the Blues in the offseason. If we miss on him, who are some players that might be of interest via FA or via trade? This is a good question. Jeff Gordon would be a better person to address this question. Why is one of our best players Jedd Gyorko sitting on the bench? Mike started 3 players hitting under 160 and 1 more just over 200. Why? Cardinals do not need Josh Donaldson they just need to play Gyorko! I agree that Jedd Gyorko should play more. If anything, I'd argue that he and Paul DeJong are the only infielders who have proved that they should start consistently. The advance metrics show that Matt Carpenter has hit the ball better than his batting average would indicate. Jose Martinez is tied with Marcell Ozuna for the team lead in RBIs, but he clearly is still trying to develop defensively at first base. Perhaps it might make sense to start Gyorko at third and have Carpenter split his time between second and first at the expense of Kolten Wong and Martinez, respectively. Do you see the Blues as a playoff contender if they don't get an upgrade in goal, and since there doesn't appear to be an upgrade available this year what do you see the Blues realistic ceiling as? If they shore up the power play and add a center, the Blues should be a playoff contender next season. It's important to remember that the Blues missed the playoffs by only one point. Why the continued P-D optimism that this team will hit? Ozuna and Carpenter appear saddled by nagging shoulder issues carried over from last season that show no signs of improvement anytime soon. Fowler who was never regarded by the league has anything better than an average player aside from his last year with a star studded Cubs lineup is clearly in a state of decline. If these guys don’t hit and Pham can’t stay healthy, this team is in serious trouble. Everyone else in this lineup is a role player especially without Molina out. Am I being too harsh? You are being too hard. It seems like elite offensive talent costs a premium. I'm sure elite defensive talent is equally the same. But at this point, the Blues have had a really solid top 4 defensive pairing. Maybe it's time to trade from that to see if we wouldn't be better served by shifting some of the balance to the offensive side? Interesting theory. I'll check in with Doug Armstrong to see what he thinks. Hi Mr. Ortiz. Would you be surprised if Molina was back sooner than people expect? I was told Saturday night that he would likely be out four to six weeks. That's what I expect. Knowing Yadier Molina, though, you can bet they'll work hard to return as close to four weeks as possible. How many games behind the Cubs will the Cards be when Yadi returns? This is a very good question. All those fans who had been clamoring for Carson Kelly are about to be reminded just how valuable Molina is. There's no denying that Molina's loss will impact the Cardinals. It's just a matter of how much his absence will affect the team negatively. Cards looking like they need that second bat they didn’t get this offseason eh? I wouldn't say that. They just haven't received the production they expect to get this season from Dexter Fowler, Matt Carpenter and Kolten Wong. After Wong's season last year, the Cardinals didn't view a hole at second. Carpenter had some questions to answer with his throwing arm at third, but the Cardinals have protection at third with Jedd Gyorko. The Cardinals didn't appear to need another bat this offseason, but they might need one at the trade deadline. I know it is heresy to suggest removing Carpenter or Fowler from the line-up, but can they at least be relocated outside of the top half of the batting order until they start hitting? They are both an automatic out right now and there is nothing to suggest that is changing. The 1-5 should be Pham/Gyrko/DeJong/Martinez/Ozuna, period. DeJong raked in the 3-spot last year. What are you talking about. They have received days off. As the last week proves, they aren't automatic outs. Count their clutch game-winning home runs or game-tying hits over the last week. Don't forget that Jose Martinez has also struggled lately. Is Mabry's job safe as long as the Cardinals are in the division race - regardless of how bad the are hitting? Or can you envision any scenario where a coaching change like that would be made while the team is still hanging in a tight race? I assume all the coaches are safe as long the Cardinals are atop the NL Central or close to the top. When a person is optioned back to Memphis do they actually have to travel to Memphis or wherever they are playing, or can they stay with the major league club if they know they will be called back up within a few days? They have to report at Memphis. Remember, players must remain in the minors 10 days before they're eligible to be called up again. Orioles not heading anywhere, do you foresee a trade/bidding war between cubs, cardinals for Machado? I can envision the Cardinals going after Machado, whose price shouldn't be as high at the trade deadline because he's going to test free agency. I will tell you that the Orioles have already started scouting the Cardinal's roster, including the young, controllable players already up in the majors. I appreciate your reporting, but took exception to your tweet Saturday night where you reported "devastating" news for the Cards. Given that Bengie had requested prayers, and all the truly awful news the Cards have had in the past (Kile, Hancock, Oscar), can you understand why some thought it was irresponsible to use that word in a tweet and then disappear for the rest of the night? I was looking forward to this question. I'm not responsible for your mind racing into something that I didn't imply. A trusted source told Saturday night that the Cardinals would be without their heart and soul for four to six weeks. As far as I'm concerned, that is devastating news. Do you really think somebody has died every time you hear somebody uses the word "devastating?" Furthermore, don't you think other St. Louis reporters would have been on alert if somebody was on their death bed. I have a life. I'm not expected or required to stay up all night updating my Twitter feed, which is free to the public, all night. How was it irresponsible for me to say that I was trying to confirm some devastating news when in fact that's exactly what I was doing? I guess one can have an argument over semantics on what qualifies as "devastating news." Unfortunately, my feed was full of some people who didn't think the news I broke qualified as "devastating news." It's clear that those people view Molina's importance to the team differently than I do. But I'll also say that some folks didn't think the injury was devastating. As a man, I can tell you that the majority of them I know would tell you that it would be devastating to have somebody foul a 102-mph pitch into their pelvic area. We must agree to disagree on your suggestion, but there's no denying that I was confirming devastating news that I broke as soon as I got confirmed by a second source. It would have been irresponsible to report that news when I heard it without a second source. Why was Garcia starting over Gyorko yesterday? It hurt the team offensively and defensively. With a struggling offense, you'd think the manager would play the better hitter. Not to mention the fact that he's a vastly superior defensive player to Garcia- which was important with a groundball-heavy guy like Martinez on the mound. Baffling. That's a good question. I'm sure there was a thoughtful reason, but I didn't ask. Is Carp unlucky, or does the league know how to defense him and he hasn't made the counter adjustment?